Rumor has it engineer David Posey is the No. 1 designer of proximity switches in the world. Posey, himself, won’t go that far. But, he’ll argue HSI Sensing is one of the best in the business when it comes to the company his father built and the one he’s taken to new heights. Based in Chickasha, HSI Sensing is the innovative leader in the engineering, design, and precision manufacturing of custom reed switch and sensor technology. HSI is the industry expert at solving problems for customers dealing with challenging design applications. 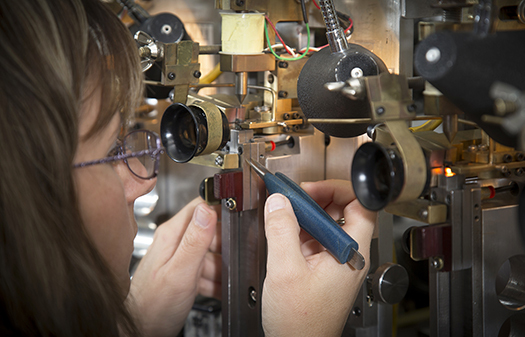 Also, Posey’s company precision manufactures solutions with consistent, unmatched quality. The company is now on its third generation of Poseys, with David’s son serving as president and his nephew serving as vice president. And the company’s relationship with the Oklahoma Manufacturing Alliance has definitely been handed down from generation to generation. Five years ago, Manufacturing Extension Agent Mike Raymond introduced the younger generation of Poseys to Lean Manufacturing, which has yielded at least a 20 percent increase in efficiency. Mike Raymond is sponsored locally by Redlands Community College and Canadian Valley Technology Center. HSI anticipates a $2.2-million annual impact, thanks to the Innovation Management System. The company is one of the first in the state to participate in this new program. David Posey says the Manufacturing Alliance has not only introduced his family’s company to good concepts, but connected the company to a variety of public and private resources. He says his father, William “Bill” Posey, would be thrilled with the new processes. Also, HSI Sensing has been able to diversify its client base through a strategic look at its global business. No one customer now accounts for more than 12 percent of HSI’s top line. The company was honored with the Governor’s Export award two years ago and, again, this year received the Governor’s certificate for exporting. A few months ago, HSI was recognized as the Small Business Administration Family Business of the Year. As one of Oklahoma’s great community and state leaders, HSI Sensing continues to innovate and grow. Based in Chickasha, HSI Sensing is the innovative leader in the engineering, design, and precision manufacturing of custom reed switch and sensor technology. HSI is the industry expert at solving problems for customers dealing with challenging design applications.